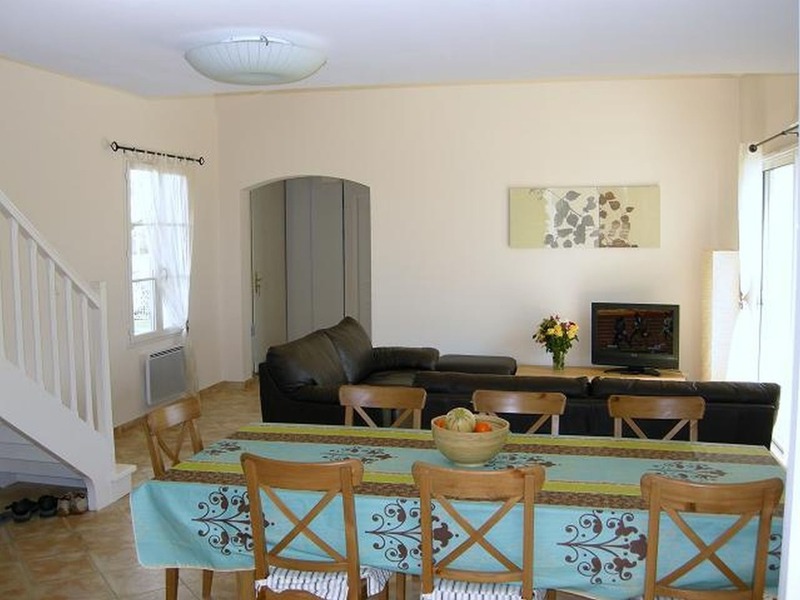 This spacious villa offers comfortable family holiday accommodation and well positioned on the Domaine. 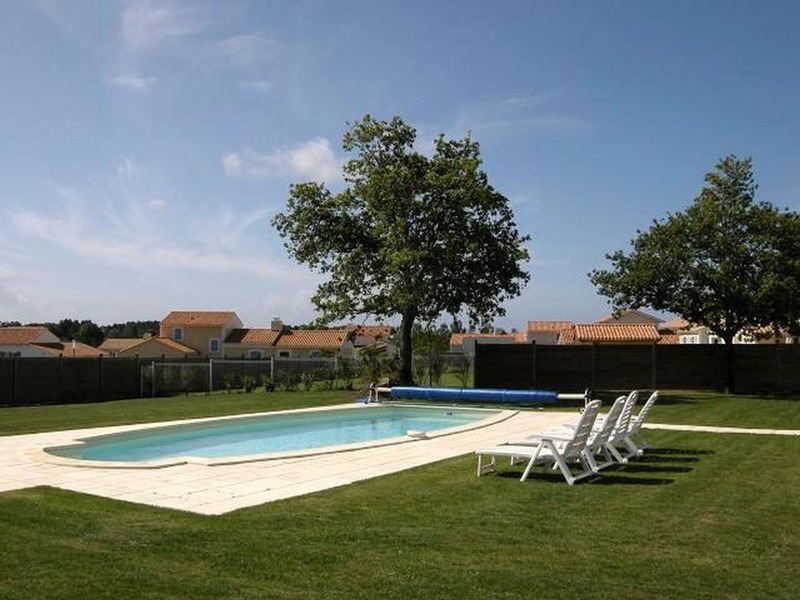 Ideally situated on the close to the Vendee coast (15km) and local amenities. 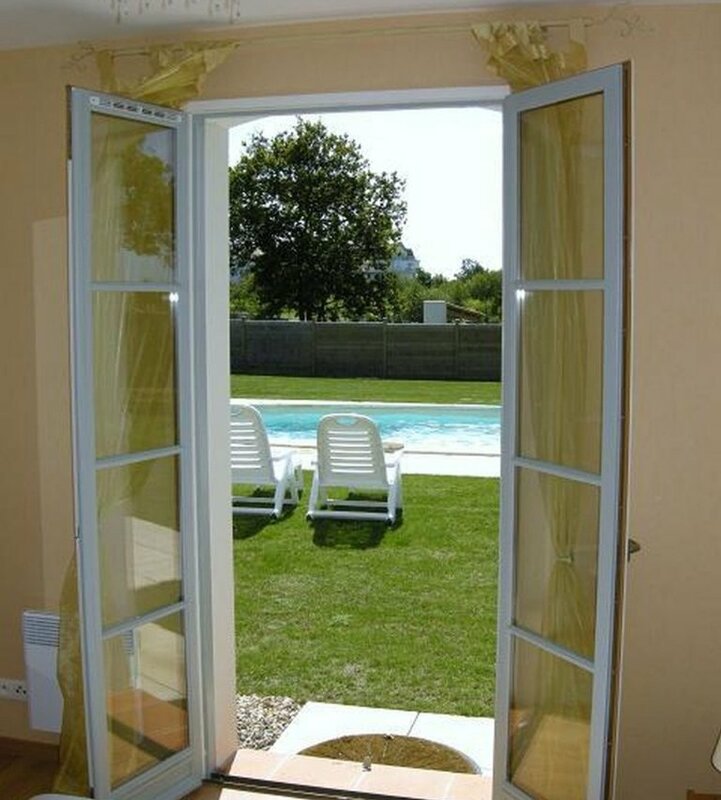 Set in a calm residential area on the Golf complex of Fontenelles, it has a private heated pool and enclosed garden. Cycle hire is available, bookable in advance. 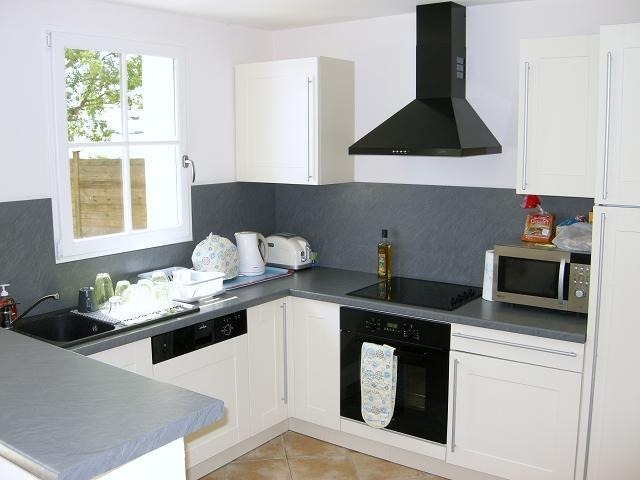 The pretty port of St. Gilles Croix de Vie is 15km away with its bars and restaurants. 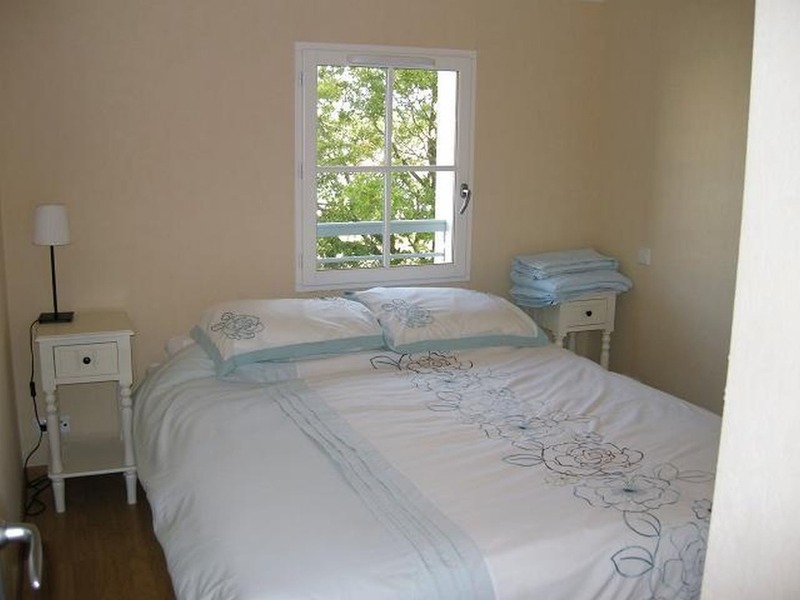 Bed linen and towels (non pool) are included in the weekly price as is free WIFI. Ideal for golfers and beach lovers alike! 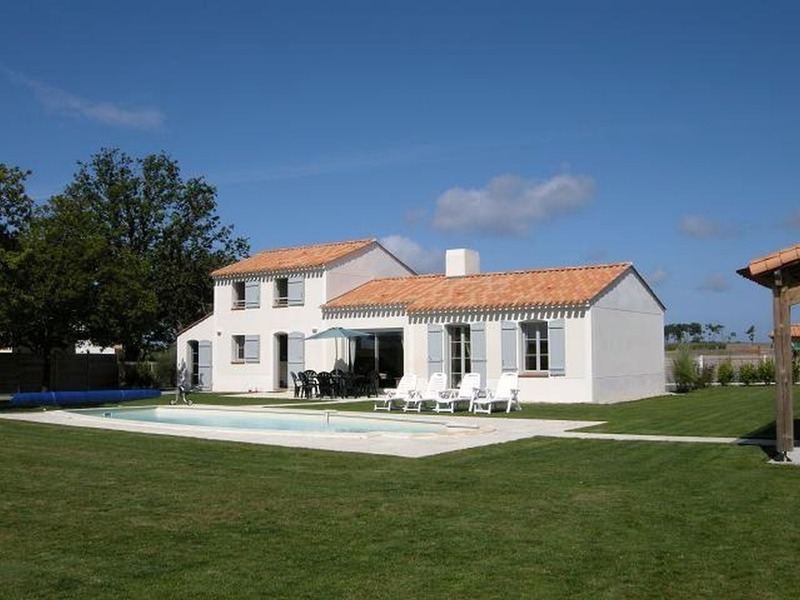 Located in Saint Gilles Croix de Vie, in the centre of the western coast France and on the outskirts of an 18-hole golf course, Villa Alba offers guests easy access to the beach, which is just a 15-minute drive away. Situated adjacent to the Madame Vacances complex this privately owned and run villa is ideal for those wanting to enjoy golf, theme parks, the beaches of the Atlantic and more. Saint Gilles Croix de Vie is a seaside resort on the Vendée coast, between Saint Jean de Monts and Les Sables d'Olonnes Immerse yourself in the beautiful surroundings, with hiking, cycling and more available in the local area, or make the most of the close proximity to the golf course during your stay. Coëx is just 5km away and offers shops, restaurants and cafés, as well as a pretty village feel and parks. The town of Saint Gilles Croix de Vie also offers a wide range of activities, including a theme park, along with plenty of outdoor pursuits. 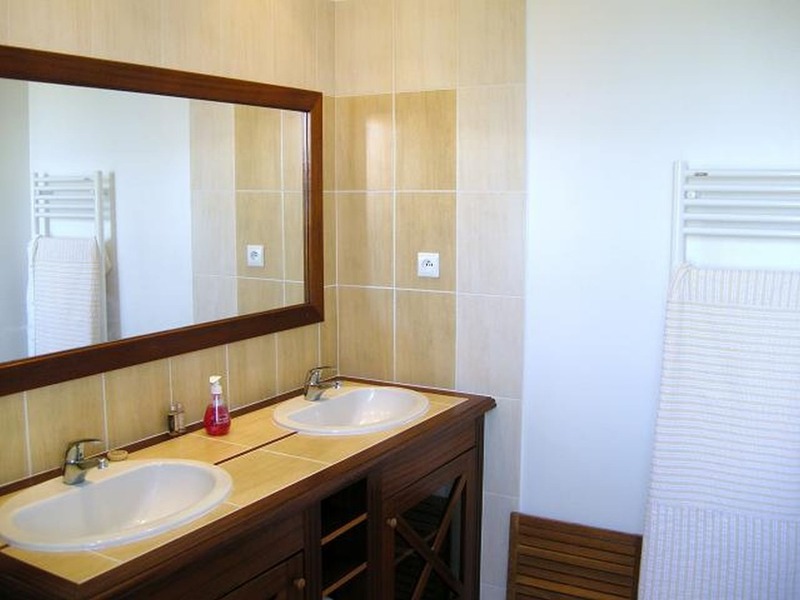 The luxury villa is available for private rental with 4 large bedrooms, one of which is on the ground floor (2 x doubles, each with separate dressing rooms and 2 x twin bedded) and 2 luxury bathrooms (each with shower) and separate toilets. 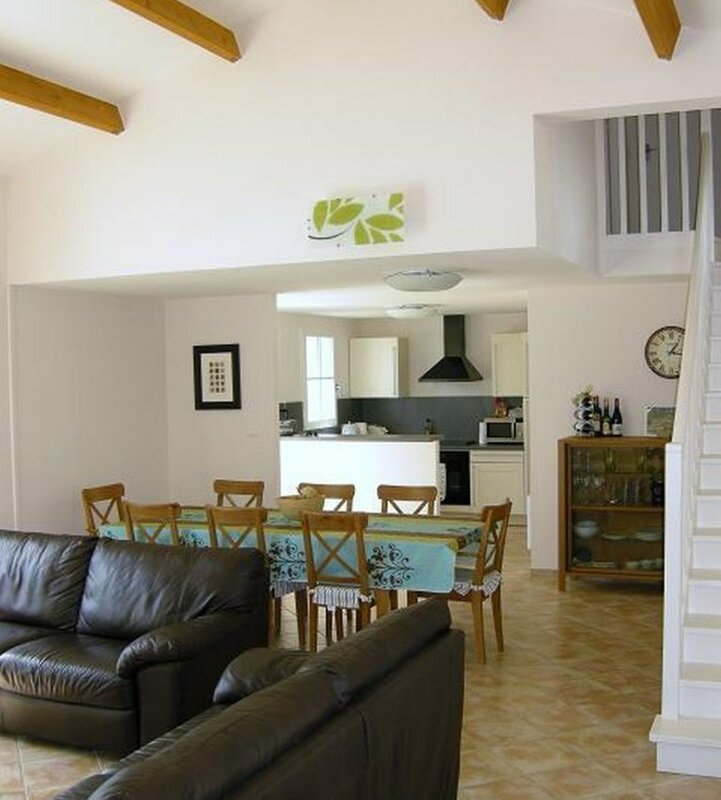 There is a large open plan living and dining area that leads to a well appointed modern kitchen. Patio doors lead to a terrace and barbecue area. The large private enclosed garden includes a large lawned area that surrounds the swimming pool. Garden furniture and sun loungers are provided for your use. The swimming pool at 9.5m x 4.5m is heated and equipped with a security cover and alarm. Free WiFi is available in the villa plus a TV, DVD player. There is a washing machine, dishwasher and microwave at the property. Local attractions include Puy du Fou, the city of Nantes and La Rochelle and the islands of Noirmoutier and Il de Re. 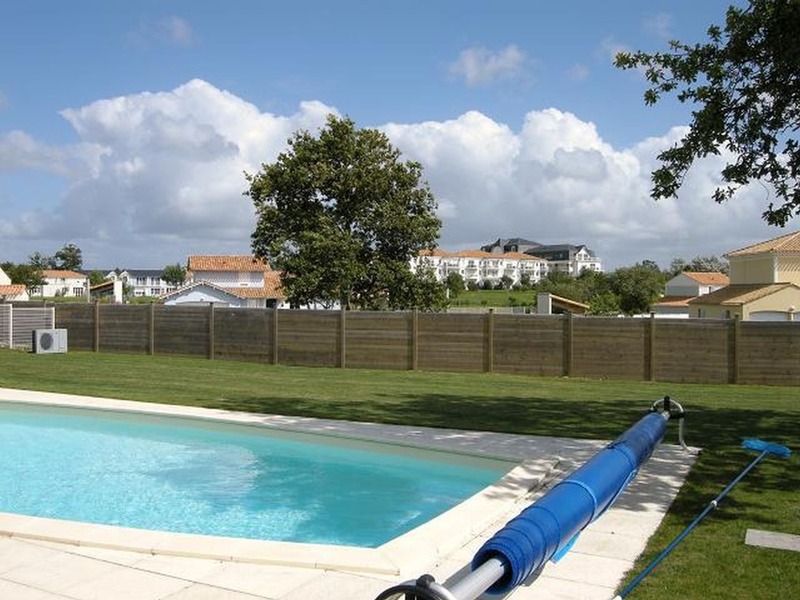 Set in the gated community of Domaine de Fontenelles, a great holiday complex with golf course and restaurant, 8 km from St Gilles Croix de Vie. 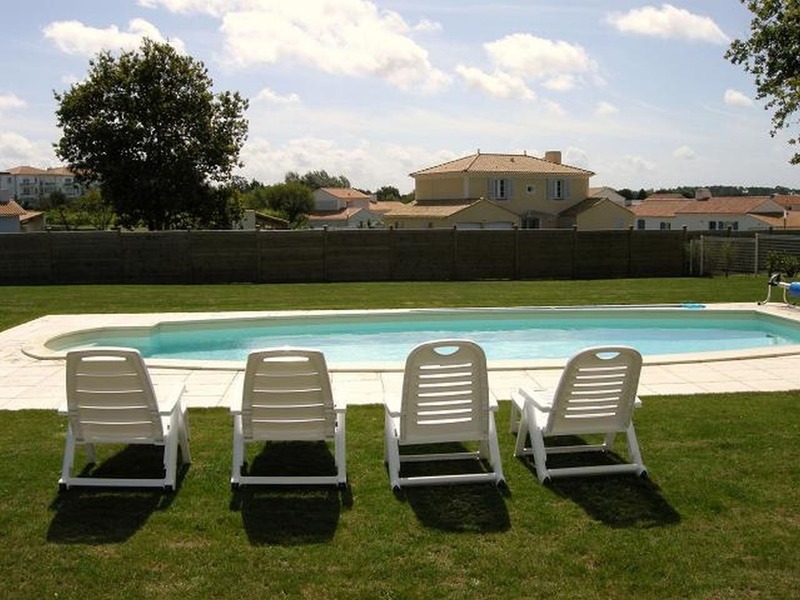 Ideal for a family holiday, golfing holiday or for exploring the Vendee coastline. These terms and conditions detail the agreement of temporary property rental between the Client and the Owner. The Client is over 18 years of age. Where the Client is two or more persons, each Client will be liable for all sums due under this agreement and not just a proportionate part. 1.1. The Client acknowledges that the Property is not an official tourist structure or hotel. 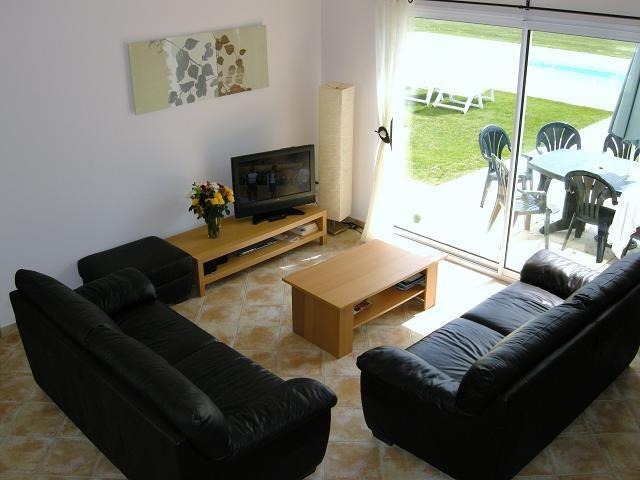 Rather, it is a private accommodation being let solely for a self-catering holiday. 1.1.1. The Client further accepts that the Property does not have standards or categories recognised internationally, but instead reflects, in its architecture and furnishings, the local traditions and personal taste of the Owner. 1.1.2 The Client should avoid making comparisons with other properties or with standards of those in their home country. 1.2. All information and terms specific to the Property detailed on the website advertisement are incorporated in this agreement. 1.3. Unless otherwise stated, the rental period starts at 16.00 on the Arrival Date and ends at the latest at 10.00 on the Departure Date. 1.4. Unless otherwise stated, rental of the Property includes all local taxes, utilities, linen and towels (except beach / pool towels). 1.5. 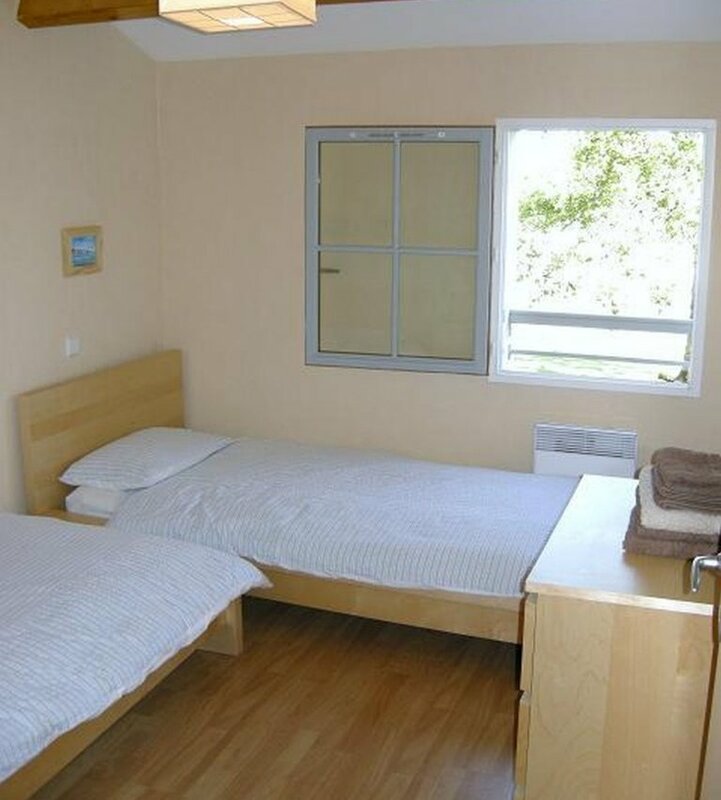 The Client is kindly requested to leave the accommodation and the items therein in the same state of cleanliness (excepting linen and towels) and general order in which it was found, and with the various items of furniture and other items left in the places in which they were situated on the Arrival Date. 1.6. The persons residing in the Property, during the rental period, must be those stated on the booking form, which must not exceed the maximum number stated in the website for the Property or advised to the Client at the time of booking. 1.7. The Client must permit the Owner or Owner's representative reasonable access to the Property during the rental period; whether to inspect, carry out essential repairs or for any other reasonable purpose. 1.8. The Client, and the persons residing in the Property during the rental period, shall have no rights whatsoever in respect of the Property except to occupy as holiday accommodation for the period booked. 1.9. This agreement is personal to the Client and may not be assigned or transferred by either party. The Client shall not sub-let or part with or share use or possession of the Property. 1.10. The Client should report any breakages and / or defects in the Property or its contents to the Owner or the Owner's representative without delay. 1.11. The bringing of pets on to the Property is forbidden. 1.12. The Property must be kept locked at night and whenever unattended. 1.13. The Client is expected to act in a manner that would not cause unacceptable disturbance to residents in neighbouring properties. 2.1. The currency in which rental rates are advertised and all rental payments are accepted is detailed on the website advertisement relating to the Property. 2.2. Rental payments can be made by cheque or bank transfer in the specified currency. 2.3. A 20% deposit payment is due immediately to confirm your reservation. This deposit payment will be paid to the Owner. 2.4. The final balance is due 8 weeks prior to arrival. This payment will be paid to the Owner. 2.5. Balance payment reminders will be issued by e-mail 9 weeks prior to your arrival. 2.6. The total rent is payable immediately in full for bookings made within 9 weeks of the Arrival Date. 3.1. The value of the security bond will be set at the time of booking. 3.2. The Client will be informed whether the security bond is payable via Vendee Holiday to the Owner or is payable on arrival to the Owner / Owner's representative. 3.3.1. The security bond is payable in cash on arrival to the Owner or the Owner's representative. 3.3.2. The security bond (or part thereof) will be returned to the Client on the day of departure from the Property. 3.3.3. Any dispute regarding a deduction from the security bond is to be addressed to the Owner or Owner's representative. 3.3.4. Vendee Holiday is not authorised to enter into any correspondence concerning the security bond. 3.4.1. The security bond is payable with the balance payment 8 weeks prior to arrival. 3.4.2. The full value of the security bond will be allocated or transferred to the Owner who will account directly to the Client for any monies to be returned. 3.4.3. Vendee Holiday accepts no responsibility or liability for losses incurred by the Client in respect of the security bond. 3.4.4. Any dispute regarding a deduction from the security bond must be addressed to the Owner. 3.4.5. Vendee Holiday is not authorised to enter into any correspondence concerning the security bond. 3.4.6. If no deduction is required by the Owner, the security bond will be returned to the Client within 14 days after departure from the Property. 3.5. Any breakages, damage or loss caused to the Property or its contents during the rental period may result in the forfeit of some or the entire security bond. 3.6. Notwithstanding the security bond held, the Client remains liable for the full cost of any repairs or replacements required or other losses incurred by the Owner due to accidental or negligent breakage, loss, damage or otherwise injury to the Property and/or the contents therein. 3.7. The Owner has the right to deduct supplementary charges from the security deposit if the Property is not vacated at the stated time or in the event of any other breach of this agreement by the Client, but this shall not prevent the Owner from receiving such charges from the Client by other means. 4.1.1. Only written notification of cancellation will be accepted. 4.1.3. If the Property is rented by a new client for the Client's cancelled dates, at the same rental rate, the Client's payments will be refunded in full. 4.1.4. If the Property is rented by a new client for the Client's cancelled dates, at a discounted rate, the Client's payments will be refunded minus the discounted amount. 4.1.5. If the cancelled dates are not rented, no refund of payments will be due. 4.2.1. The Owner reserves the right to modify or withdraw any booking due to circumstances arising which are beyond their control. 4.2.1.1. Should the Property become unavailable for the reserved dates, the Client will be notified as soon as possible and a full refund of all payments will be made. 4.2.2. The Client agrees to take out holiday insurance cover to ensure any losses incurred due to Client or Owner cancellation are fully covered. 5.1.1. A comprehensive travel insurance policy, which will include cancellation cover and full cover for the party's personal belongings, as no such cover is provided by Vendee Holiday or the Owner. Accordingly, such loses are the responsibility of the Client. 5.1.2. Personal liability and accidental damage insurance for all members of the party to cover against accidental or negligent damage to the Property, and protect against loss in the event of a deduction from the security bond (this is often included as part of a comprehensive travel insurance policy). 5.2. The Client is advised to take out additional breakdown and motor insurance if on a self-drive holiday. 6.1. The Owner shall not be held responsible for any temporary defect or stoppage in the supply of public services to the Property such as water, electricity, gas, telephone or internet, or in respect of any equipment, machinery, or appliances in the Property or garden, which are not caused by the Owner. 6.2. If the Client is dissatisfied with the cleanliness or presentation of the Property, it should be indicated to the Owner or the Owner's representative as soon as possible so that, where possible, all issues can be promptly resolved. 6.2.1. If any issue is not resolved at the time to the satisfaction of the Client, any dispute is to be addressed to the Owner or the Owner's representative as soon as possible. 6.3. If the Client fails to notify the Owner or the Owner's representative of any problem or dissatisfaction prior to departure from the Property, it may affect the ability to investigate complaints and impact the way that any complaint is handled. 6.4. The Owner accepts no liability or responsibility whatsoever for any accident in the Property, save any for personal injury or death arising from the Owner's negligence. 6.5. Children MUST be supervised at all times. 7.1. All Property descriptions, information and photographs displayed on this website have been approved and accepted by the Owner as an accurate representation of the Property. 7.2. Great care is taken to provide accurate information on the Property and general area in which it is located. 7.2.1. 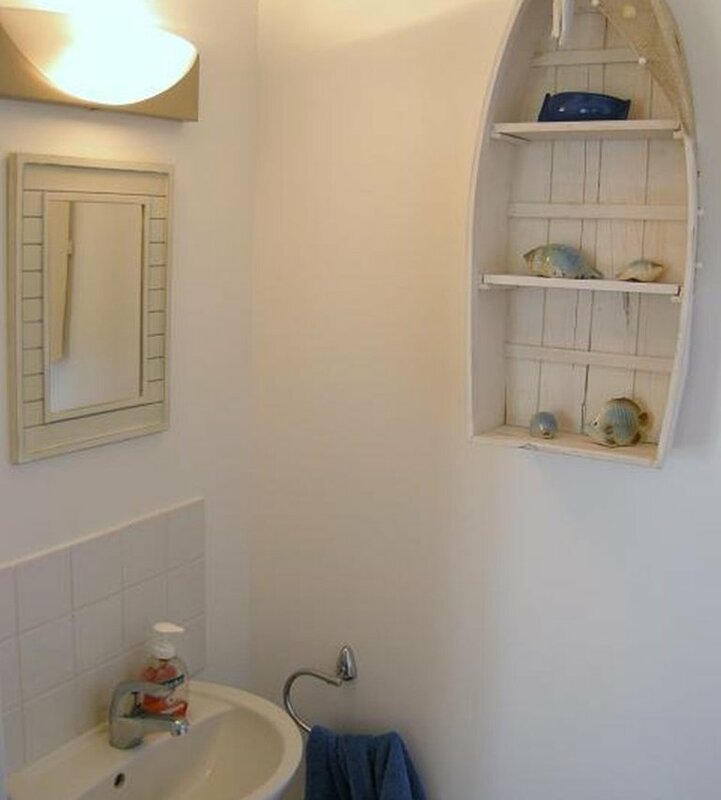 However, there may be occasions when facilities or circumstances, which are not under the control of the Owner, may not be available or would cause inconvenience to the Client. 7.2.2. The Owner will endeavour to inform the Client of any such changes or circumstances in advance, although this will not necessarily entitle the Client to cancel the booking without the usual penalties as detailed in clause 4.1. 8.1. The Client and Owner agree that if any one of the clauses or part of a clause of this agreement is held to be against the public interest or unlawful or in any way unenforceable, the remaining provisions of this agreement shall remain in full force and effect and bind the Client and Owner. £200.00 to be refunded 7 days after departure after a property check.